Last week in Portland the weather gave us a true taste of spring. It was sunny, warm and perfect! We started the weekend out right on Friday heading over to this kind of gourmet food court near our house, called The Ocean. It has a few of mini-restaurants from known chefs around town. Each one is pretty focused on one type of food. This time we were trying out Slowburger. This thing was massive, a half pound! But soooo good! Plus those fries were perfect. Cannot wait to go back! Saturday was spent finishing up the garden. We had some more pots to fill up with new plants, as well as to finish roto tilling up some areas that needed it. Now we have pretty much finished up all the hard work in the garden. It all looks great! Now I can’t wait for those veggies to do their thing and start giving us our little crop of yummies. 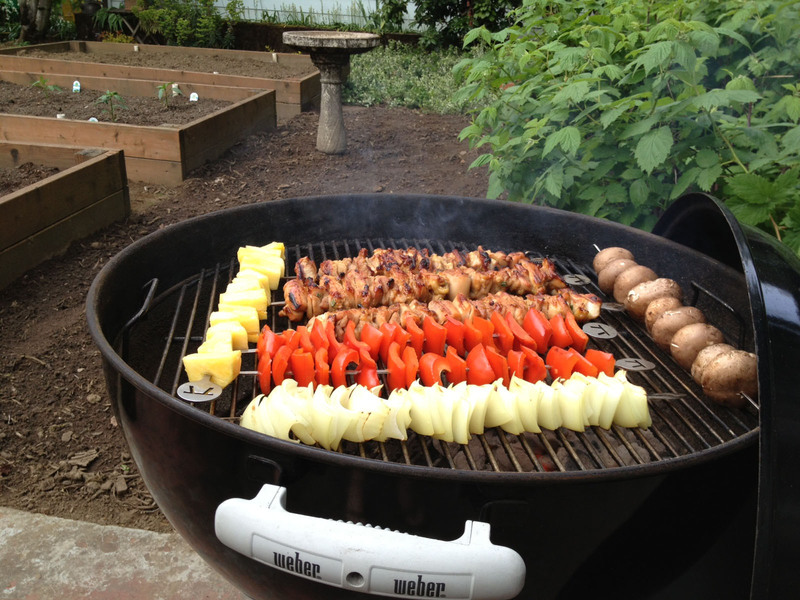 We had friends over Saturday night for a little grillin’! Sadly it was a bit too chilly to eat outside, but our first grill session of the year was a success! We made up some teriyaki chicken and veg kabobs. So, good! Sunday, we had all to ourselves. The agenda for the day was to just relax. We took a nice long walk in the morning, then just chilled out all afternoon. For dinner, we walked over to try Atomic Pizza, a new place that just opened up next to the Hollywood Theater. 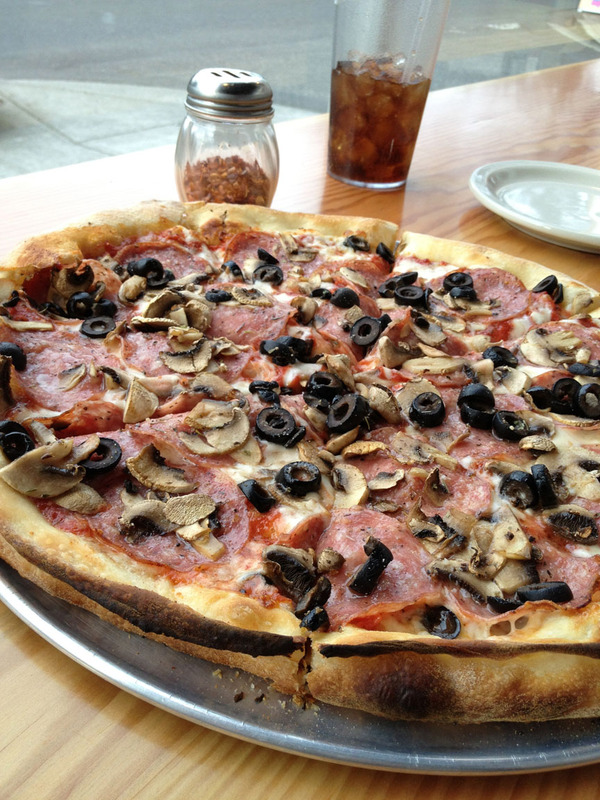 We got the Portland Blvd; mushrooms, salami and black olives. It was a nice pie, flaky crust – not heavy or too bready. It’s a nice pizza option in our rotation of favs. We will go again for sure. The weekend ended with a bang, as my Etsy shop was featured on a great local blog, House of Moss. Alison, the woman behind House of Moss, is a local creative who has a great series spotlighting other Portland artists called We make Portland awesome. She was kind enough to feature acbcDesign this week. Check it out and explore some of the great talent found here in PDX! 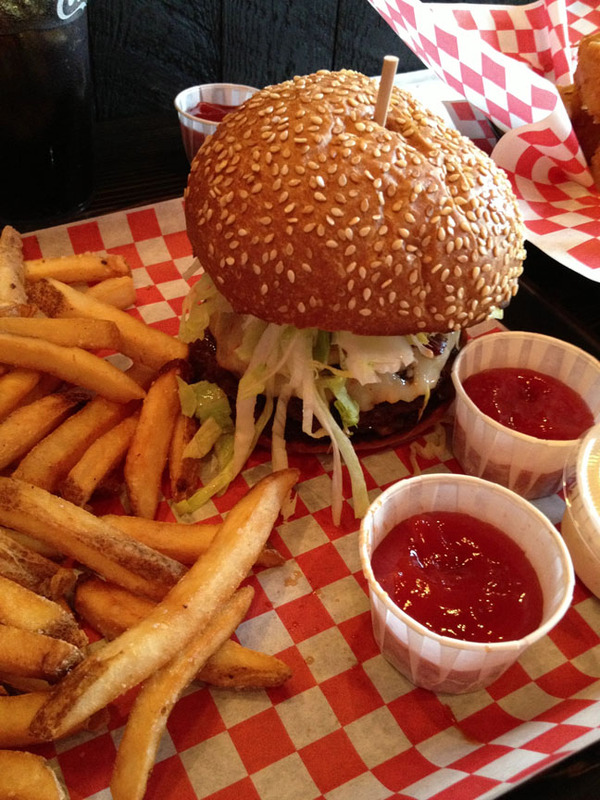 Looks like you had an amazing weekend with some amazing food. Congrats on being recognized for your talent. Thank you for visiting my blog. Thanks Melanee! Congrats to you on your blog nomination as well!